Police officers, and people who routinely concealed carry, are often told that the bad guy is a continuous threat until you have confirmed that they are fully incapacitated or disarmed. This is a two-way street, and it is important to remember that just because you are shot in a self-defense situation does not mean that you are out of the fight or incapable of continuing it. 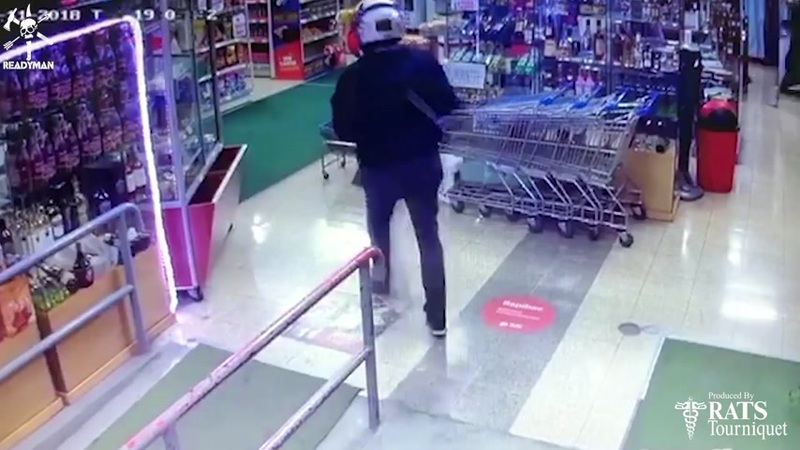 In the video you are about to watch, a store owner in Costa Rica makes the decision to defend his shop from an armed robber with his concealed handgun. In the process of opening fire on the robber, he is struck by a return fire round that travels through a glass display case and knocks him onto his stomach. When the robber returns to disarm him and continue his robbery, the store owner fights through his injuries to defend those around him. After the store’s owner takes a round that puts him on his stomach, the robber returns to finish him off and disarm him. In this instance, had the store’s owner not had the determination to keep fighting through his injuries, he would have been executed and left those around him defenseless. Staying in the fight and continuing to press his attack from the prone position pushed the attacker off balance, which in turn allowed him to overcome the attacker. According to a local news station near the shop where this footage was recorded, law enforcement and other first responders arrived on the scene just minutes after the shoot out occurred. Both the robber and the shop owner were transported to a nearby medical facility. The robber died to his injuries while the store’s owner managed to survive.